GORGEOUS and super warm like new condition purchased at Macy’s for over 1,000 USD a STEAL at $250!!! Marco Gianotti Sheepskin Shearling Woman's Coat size 4. Condition is Pre-owned. Shipped with USPS Priority Mail. 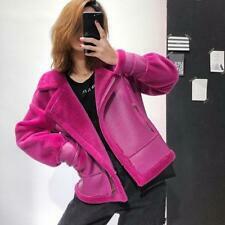 SHEEPSKIN Coat LEATHER Wool FUR Jacket Womens. Condition is Pre-owned. Shipped with USPS Priority Mail. Excellent quality, thick fur. Very warm and cozy, the middle calf length. - Hip to hip: 23.5". - Shoulder width: seam to seam: 16". - Back Length: 46". Here we’ve got an awesome Overland Sheepskin Co. Jacket. Shorter, cropped style. Sweet oversized shearling cuffs and collar. 4 antler buttons, and an additional sewn inside in case you lose one! Very warm and great quality! Good used condition, light wear to the Suede on the front. Wear to bottom button loop. Not marked, but would say it is a small or size 6. Measurements laying flat, buttoned all the way up, Shoulder to shoulder, about 17.5” Armpit to armpit, about 19” Back of the neck to the bottom hem, about 22.5” Armpit to bottom of sleeve, about 18.5” Please feel free to ask questions, and check out our other items! Real leather sheepskin coat for women. Very warm. After pregnancy it doesn’t fit me anymore. Made from then Highest Quality 100% Lamb skin shearling suede Leather. 100% lambskin. Coat is brown with brown fur - long coat. heavy thick warm coat! Fits like an extra small. 28.5 collar seam to botto. Overall solid. 100% REAL GENUINE SUEDE SHEARLING LEATHER with 100% REAL GENUINE SHEARLING on the hood. This genuine shearling leather COAT is buttery soft, lightweight, comfortable, not lined in any way, and super warm. Vintage 1970s approximately ladies ranch coat, three buttons (Plastic). Sueded Brown leather with attached lamb for for the lining. There is normal wearing on the cuffs, however the cuffs can be uncuffed they are not stitched. Needs collar cleaned to match the fluffiness and vibrancy of the lining. Beautifully made. Stored covered. Armpit to armpit laying flat fully buttoned 25 inches across. Across bottom side to side 27 inches. Sleeve length Shoulder seam to unrolled cuff is 25 inches. Back length from collar seam to bottom same 31 inches. Sawyer of Napa. Top of Shirt to Bottom: 45". Sleeve to should seam: 24". Where it's ok to be ballin' on a budget! Armpit to Armpit: 20.75". We are featuring. Size Shoulder (cm) Bust (cm) Waist (cm) Length (cm) Sleeve Length (cm). Length: 42 top of collar to bottom of coat. Shoulders: 17.5 seam to seam. Made from then Highest Quality 100% lambskin. Also, there may be shade variations which are inherently part of the leather. Two front side pockets & 1 inside zip pocket. Women's Genuine Sheepskin Shearling Suede Coat Jacket Size L Shipped with USPS Priority Mail (1 to 3 business days). Very soft – both the outer suede and the inner fur. by Luigi Leather Wear. Sleeves can be adjusted to the desired length. "40.9 (104 cm) length (bottom of collar to bottom hem). “SAWYER of NAPA” Women’s VTG COWBOY COAT - Shearling SHEEPSKIN 100% Wool.!! HELMUT LANG. You will receive a Helmut Lang jacket. CHEST 19" across ( FROM ARMPIT ARMPIT ). SLEEVES 26 " ( FROM SHOULDER TO CUFF). LENGTH 23" ( FROM BOTTOM NECK TO BOTTOM ). Wa rm, smootha nd c om fo rt ab le. Fully lined with what is believed to be pink/brown dyed lambswool. Zipper front. 2 front flat pockets. Distinctive pink and silver buttons used with pink leather strap to fasten collar. Size is Large. Zipper closure front. Two front pockets. Removeble hood. Very casual brown- burgundy sparkling color. New item from China. Super casual quality! Incredibly soft, vintage 1970’s 1980’s genuine sheepskin jacket. Silk lining. Buttons closed, pea coat style. Two front pockets. Knight brand, made in England. Size Small, fits true to size. Chest- 18.5” Shoulder- 17” Length- 23” Sleeve length- 23.5” Excellent condition, no flaws. Please note, some shedding may occur during wear. Shipped with USPS Priority Mail. Two side pockets. Front button fastening (3 buttons are missing and no spares). Embroidered Hooch logo. In great clean condition. Machine washable. As of February 2013, the Fashion House is part of the Paris High Fashion Syndicate. BALMAIN Coat / Jacket. - Zipper BALMAIN. Characteristic and Features EU 36 / UK 8. We hope it is what you were looking for. 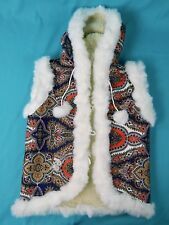 Vtg Norm Thompson Sheepskin Shop Genuine Shearling Coat W/Hood USA Women's 14. Condition is Pre-owned. Shipped with USPS Priority Mail. Minor dirt and wear. A couple minor scrapes on sleeve. Missing two buttons on front. Button on removable hood. See pics. Still in good condition. Pit to pit 20", length 30", sleeve from shoulder 23". This coat is nearly new, only worn on mountain vacation and we don't use these type heavy coats in South Carolina! • Style: Coat. Sleeve: 27". Bust: 40" fits 36. Shoulders: 18". Thick, plush & soft golden brown shearling lining & collar. COMMUNICATION: I answer all ?. Length (bottom of collar to tail): 29". Chest (armpit to armpit): 19.5". Like new condition. Length (top to bottom): 28 ". Sleeves: 26 ". It is a dark brown with the off white fleece trim. It has a few light blemishes on the brown nothing substantial, but they are there. Total length 29. Shoulder 20. 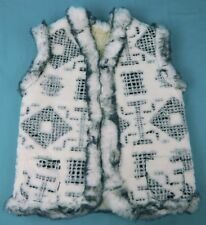 NE handmade long sheepskin coat. No defects. Great condition. Leather wrapped Buttons are intact (SEE all PHOTOS). Jacket is in used condition(SEE all PHOTOS). Past season. 26" Length (center of collar seam to hem at back). 25" Center of collar, across the shoulder,to the end of sleeve (While the collar is folded. ). Made by Rem Garson. Beautiful Shearling Leather Coat with a big hood. Leather on one side and wool on the other. Colors are a darker brown leather and black wool. 2 coats in one - one leather and one wool! Hugo Boss Women’s Sheepskin Coat... Genuine Metallic Dusted Lambskin Rockstar ! This is the most glamorous you can get while being ultra warm. It is entirely fur-lined, in the softest lambskin, in a beautiful charcoal/Chocolate color. B ust and hip of coat 39 1/2”. Full shearling fleece lining, hood, removable shoulder padding. Length: 34". Waist - 23". Shoulder Length - 18". Length (back) - 34". We are always happy to work out any problems. Made in Turkey. The model is 5 ft 9 in tall. 3/4 length. Shawl collar. Size 38 EU. US size Small.